Our camara Maxim Han has translated a part of the wikipedia’s article “List of capoeira techniques” into Chinese. This part contains Chinese explanation of basic movements such as ginga, au, balaca, Cadeira, Bananeira, Macaco, Negativa, Role, etc. 卡代拉 是 劲戈 动作中双脚并立(马步)的姿势，其实是劲戈的基础。取决于不同卡波耶拉流派而有所不同，常常是较低的蹲立位置.一只手保护面部另一只手臂伸展保护身体另一侧。由于采用较低的蹲立所以身体在腰部略弯，主要的核心肌群都参与了维持平衡(所以做的时间长了会很累)。从这动作可以毫无困难地转入所有的攻击，移动，防守动作,包括：巴兰萨(Balança)（倒立），阿乌(Aú)（侧手翻），奇达-德-瑞（queda de rins），马代落（martelo），瑞斯特夏（resistência），等等。这个动作也可以叫做‘帕雷落 (parlelo). 阿乌-巴提多（Aú Batido） 是阿乌（Aú）的变种，只用一只手支撑，且髋部扭转两腿分开。看起来像是倒立的战锤（martelo）（卡波耶拉里的另一类动作，见下文）。在这个动作过程中，一只手保护头部另一只手主要地是支撑身体。阿乌-巴提多 的字母意思是“中断的侧手翻”。这是一个防守动作，当一方想做侧手翻而另一方攻击时（通常是用卡巴萨达，用头部撞），阿乌-巴提多就派上了用场，在对方攻击之前就出其不意地先攻击。这个动作在特技表演中也很常见，并且，在霹雳舞(breakdancing)中通称为L型踢。该动作在不同的流派中也有不同的名称，包括Beija Flor（蜂鸟，字母意思为“吻花者”），Leque（扇），Aú Québrado（也是“中断的侧手翻”之意），Aú Malandro(狡猾侧手翻), Aú Amazonas (“亚马逊侧手翻”或“亚马逊的”). 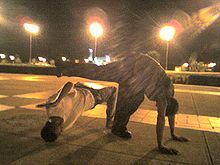 This article has been added to Chinese Baidupedia, as a part of the Capoeira article. My name is Grilo and a caporiesta based in Penang, Malaysia. I’m Malaysian Chinese and very happy Capoeira development in Shanghai, China.